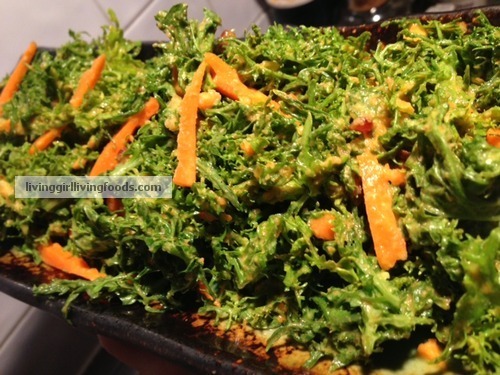 I want to give mustard greens some more love, so here is another recipe using them. This is an Asian inspired dressing that I have used in the past with recipes, which for whatever reason I can not find the post where I have used this dressing before! Sunday’s post (two days ago) I went for a sweeter very simple flavor and techniques. This recipe is just slightly more technical with chopping, oils and coconut aminos. But I mostly wanted to show some different spices, oils, vegetables and fruits that taste excellent with mustard greens. If consuming mustard greens is something new to your taste buds or may be you are curious about the health benefits please check out my previous post. I made this salad just for myself for dinner tonight, sorry my recipes are always for one :-X! If you wanted you could add a sprinkle of sesame or hemp seeds on top. Or if you like creamy dressings, add a tablespoon of tahini into the blender. May be even add some shredded red cabbage, snap peas, sprouts, slices of avocado or so on. « Q&A Post <3 "Remedies," Sensitivities, Cutting Boards and Fruit Flies.